Luxuria is the newest and most exclusive beachfront condominium residence located on South Ocean Boulevard in Boca Raton, FL. 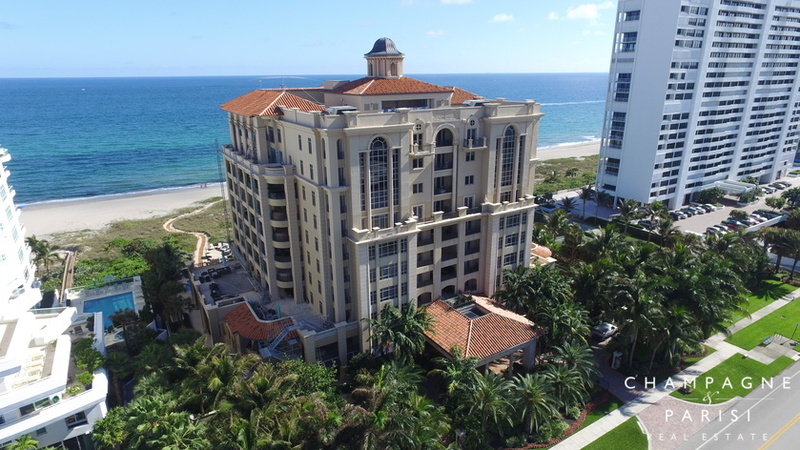 This prestigious community, developed by Boca Ocean Development LLC, a subsidiary of The Trump Group, boasts a perfect blend of Old-World elegance and modern innovation offering residents the absolute finest in oceanfront condominium living. This boutique ten-story building offers 26 ultra-luxury oceanfront condominiums, as well as two single-family estates and two bi-level penthouses situated on 256 feet of pristine beachfront property. This five-star, full-service community offers its residents the finest of on-site amenities including 24-hour security, secure garage parking, and valet and concierge service. The concierge at Luxuria tends to any and all resident needs including spa and dinner reservations, package pick-up and delivery, prescription drop-off and pick-up, dry cleaning pick-up, pet walking and grooming arrangements, airport transportation, and more! The community boasts a lavish grand entry, oceanfront pool and spa, private beach access, full-time pool and beach attendants, outdoor bar and grill, and fully equipped state-of-the-art two-story fitness center with resistance pool and personal trainers. Luxuria also features an oceanfront lounge with bar, billiards, full catering kitchen, and theater. Luxuria is located on two and a half acres of beachfront property on A1A in Boca Raton, just North of Camino Real. This prime location provides residents with easy access to all of the areas beaches, award-winning golf courses, fine restaurants, and best entertainment options. Luxuria is close to the prestigious Boca Raton Resort and Club, as well as the exclusive Boca Beach Club. This elite community is also convenient to the area's major highways, allowing residents easy access to the nearby airports and neighboring South Florida cities of West Palm Beach, Ft. Lauderdale, and Miami. If Luxuria sounds like the perfect place to call home, you may also want to visit similar oceanfront ultra-luxury condominium communities, such as Excelsior, Aragon, and One Thousand Ocean, which also offer the absolute finest in luxury beachfront living in Boca Raton. If you would like to learn more about Luxuria or any of the surrounding oceanfront luxury condominiums for sale in Boca Raton, please contact us at 561-998-9015. You may also reach us by completing our simple online contact form provided below and one of our expert agents will reach out to you promptly. We at Champagne & Parisi Real Estate look forward to assisting you in finding your dream luxury condo in Boca Raton, FL!